Grover Norquist: Pink Unicorns Aren't Real And GOP Won't Break Tax Pledge : The Two-Way The man behind Republicans' "no new taxes" pledge says Democrats won't propose "real" spending cuts or reforms. It's a fantasy to think they would, Norquist says. So, he says, even those Republicans who are suggesting they might vote for higher tax revenues won't do so. Grover Norquist, founder of Americans for Tax Reform and the man behind the pledge. There has not been a wave of defections by Republicans who signed on to his "no new taxes" pledge and even the few who have spoken about possibly going along with revenue increases won't do so in the end, anti-tax crusader Grover Norquist told NPR Tuesday. Sen. Lindsey Graham of South Carolina, for instance, imagines being willing to accept some increases in tax revenues if "Democrats would agree to fundamental reform of entitlements," Norquist told Morning Edition host Steve Inskeep. But such reform, he said, is something Democrats "haven't done in oh, I don't know, 60 years." It's like imagining a "pink unicorn," Norquist said. "If you had a pink unicorn, how many dollars in taxes would you raise to trade for the pink unicorn? Since pink unicorns do not exist in the real world, it's never occurred to me to worry about the senator from South Carolina. He's not going to vote for a deal because the kind of 10-1 ratio deal he's talking about with real, iron-clad spending cuts is never going to happen." Other Republicans will come to the same conclusion, predicts the founder of Americans for Tax Reform. His analysis of the importance being attached to things said in recent days by Graham and a few other Republican lawmakers seems to agree with what our colleague Liz Halloran wrote Monday over at It's All Politics: "GOP Pushback On No-Tax Norquist: Less Than Meets The Eye." Norquist told Liz on Monday that Graham, Sen. Saxby Chambliss of Georgia and Rep. Peter King of New York (Republicans who have talked of breaking the pledge) aren't in leadership roles on tax issues and dropped the same hints two years ago — but didn't break their pledges then. Much more from Norquist's conversation with Morning Edition is due on Wednesday's broadcast. Click here to find an NPR station that broadcasts or streams the show. By the way, at one point he talked about "silver unicorns" too. -- "There's no reason to raise taxes. Taxes should be lower. ... The problem we have is that government spends too much," not that taxes are too low. -- The stories about some Republicans saying they might break their no-tax pledge are repeats of what was being reported two years ago. "People are turning in the [same] homework for the second time," he said of the news media. But two years ago, Republicans concluded that President Obama and his fellow Democrats had not offered significant spending cuts. Norquist predicts the same will happen during negotiations to avoid the so-called fiscal cliff. -- Keynesianism is an "economic fantasy" that has hurt, not helped job growth the past four years. 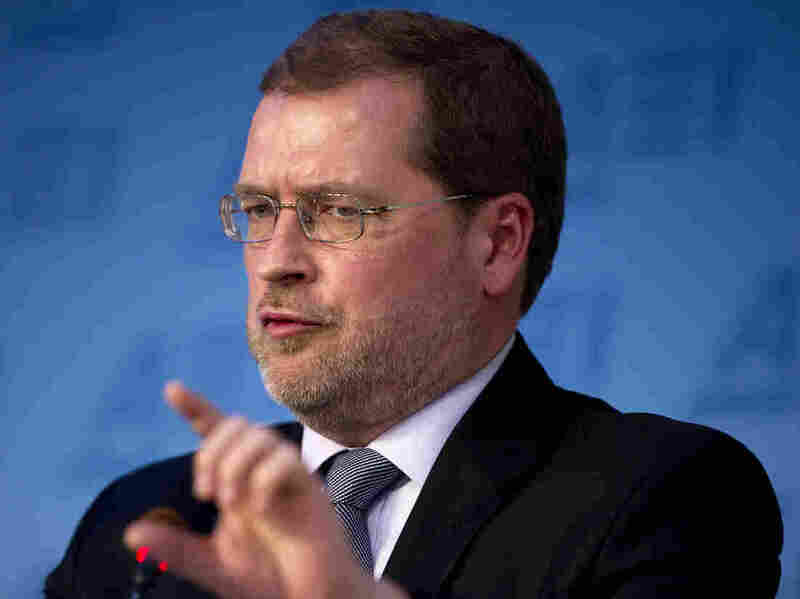 His voice rising as he spoke, Norquist said that "if we'd had a Reagan-sized recovery instead of an Obama-sized recovery over the last 3 1/2 years there would be 11-plus [more] million Americans at work. That's a lot of damaged lives because Obama has a theory and his theory was wrong — that if the government takes people's money and spends it you magically have twice as much money. ... Obama has put his ridiculous left-wing fantasy theories of Keynesianism above the lives of 11 million families in this country. That is an extremely bad thing that he did. And at some point you have to wonder why anybody does that to the country. He's done a lot of damage. We need to undo that damage." "Inside the White House, officials say the president will stick to his principles but keep his options open [on taxes, entitlements and other spending]. Spokesman Jay Carney says the president wants a balanced deal. "If you do that and you get to that $4 trillion mark, the way the president does, you will have a very positive effect, he believes — the president believes — on our overall economic prospects," Carney said, "because you will send a signal to the world that we're getting our fiscal house in order, but you'll also send a signal to the American people that we are doing it in a way that doesn't harm economic growth. It, quite the contrary, boosts economic growth." Morning Edition also this morning aired an interview Congressman-elect Ted Yoho, R-Fla., who says he didn't sign the no-tax pledge because "my philosophy is, I gave a pledge to the people in my district. ... Signing a pledge is not going to fix our debt problems or our financial woes in this country." And, "anybody in their right mind" might be willing to support higher tax revenues if federal spending is brought under control, Yoho said. Note at 7 a.m. ET, Nov. 28: This post was published at 1:05 p.m. ET on Tuesday, Nov. 27. When we added the audio from the broadcast version of Morning Edition's interview with Norquist, the timestamp was automatically changed to 4 a.m. ET Nov. 28 (Wednesday). It's a technical bug we're working to fix.